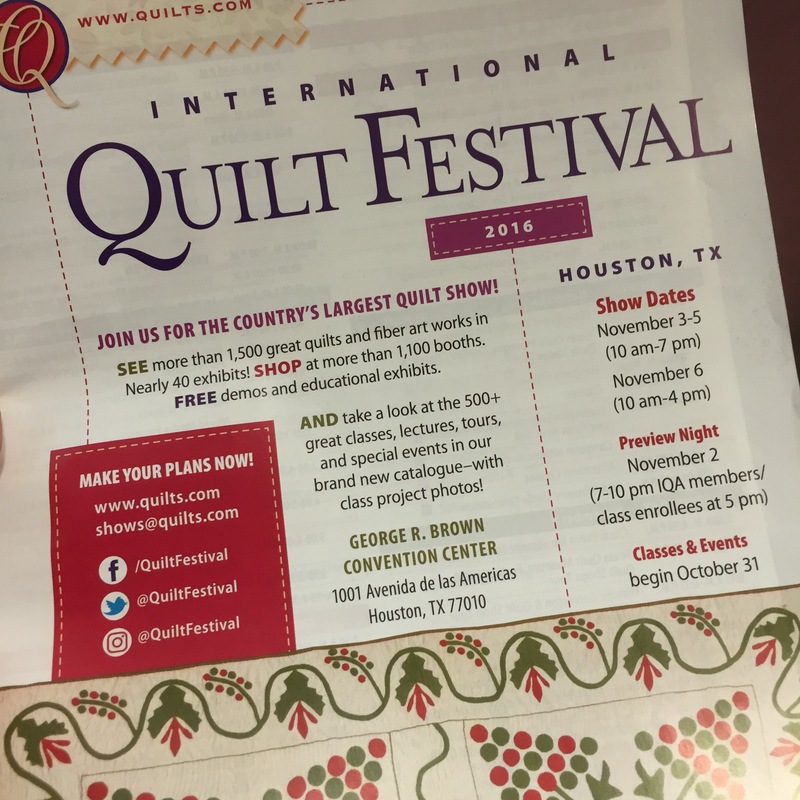 International Quilt Festival is on my mind today…my quilt is now in FedEx’s hands and on its way to be judged (🎉😉), while I sit here with the (fabulous) new-format 2016 edition of the IQF catalogue (best train reading ever). As I read it, I find myself feeling very grateful to be a part of our quilty community! The first time I went to Houston, my friend Clare O’Donohue (whose books you must read if you haven’t) told me, don’t worry, in a couple of years you’ll feel as if you know everyone. While I’m not quite there, it is such a pleasure to read through the faculty pages and see folks who are now my friends. My experience of the quilt world had been one of incredibly kind, generous (and of course insanely talented) people. Ok, next….hotel room secured – check…JetBlue flights booked – check. And now…to construct the hanging sleeve. Hmm. Ok, read instructions…wonder about that “pleat”…re-read instructions…my, these guidelines are awfully…technical. Perhaps written by the flight engineers at Mission Control? Read again, measure a dozen times, email the (very patient) Special Exhibits folks for clarification. Try to ignore husband who is hugely entertained by the spectacle of his Harvard MBA spouse praying that she doesn’t get disqualified by an illegal hanging sleeve. Whew. OK, sleeve done…label, check..pack in enough bubble wrap to cover my entire quilt studio….and off my baby goes. Get back to work on Pet Postcards! Aha, class catalogue is out, ok here we go. Wow. Lots of classes. LOTS. Huh, no supply lists. Ohhhhh….in the back. Wow, long lists…this will challenge even my ability to NEVER. CHECK. A. BAG. Amazing list of instructors!!! Snag an all-day class with Noriko Endo…lectures with other amazing art quilters…want to take every class. Wonder how much time I should leave to shop? I mean, look at the quilts? So excited…driving spouse nuts as I can’t seem to talk about anything else. Is it October yet?! This entry was posted in Uncategorized on July 27, 2016 by neonkittyquilts.